For fighter info, see Piranha Plant (SSBU). Piranha Plants (パックンフラワー, Packun Flower) are enemies from the Mario series. Piranha Plants are recurring Mario enemies that primarily live in Warp Pipes and attempt to bite Mario and other characters. They are based on venus flytraps and first appear in the original Super Mario Bros., and have appeared frequently throughout the Mario franchise. A large number of Piranha Plant subspecies exist, including variants that breathe fire, spit poison, and have other powers. There are also larger Piranha Plants that serve as bosses, such as Petey Piranha, a boss debuting in Super Mario Sunshine, and Naval Piranha, a recurring boss from the Yoshi series. Petey Piranha is the leader of all Piranha Plants. The Piranha Plant in Super Smash Bros.
Piranha Plants sometimes appear out of the Warp Pipes on the Mushroom Kingdom stage. They are enemies that don't have a settled schedule between the two pipes. They won't appear if the character is on the pipe or on the side of the pipes, and the pipes are very low, making them easy to jump over. A Piranha Plant may sometimes appear as a stage element on PictoChat. However, they don't go up or down, and they stay on the stationary platform. Also, Petey Piranha, the first boss of Adventure Mode: The Subspace Emissary, is an oversized, mobile Piranha Plant. A vicious, plantlike monster that typically hides in pipes. Piranha Plants emerge with mouths open, awaiting victims. A poorly timed jump means a chomping--hence the "piranha" name. While there have been exceptions--there are many Piranha Plants with unique traits-- they generally don't appear if Mario waits on top of or just next to a pipe. They hate fireballs. Piranha Plants reappear as just a trophy. The Piranha Plant trophy appears in both versions. In Super Smash Bros. for Wii U it is part of the Super Mario Bros. Trophy Box. These guys aren't so much carnivorous as Mario...nivorous. Ahem. There are lots of varieties, like Frost, Wild Ptooie, Ghost, Prickly, Dino, Bone, Elasto-Piranhas, Stalking, Naval... A helpful mnemonic is "Fireballs with Ground Pounds defeat baddies, even super nasties." These carnivorous plants are hungry for one thing - Mario! There are all sorts of them, including the Naval Piranha, Fire Piranha Plant, Inky Piranha Plant, Piranha Creeper, Bone Piranha Plant, Stalking Piranha Plant... But all you need to know is "plants with teeth want to eat Mario". Piranha Plant as a fighter in Super Smash Bros. Ultimate. 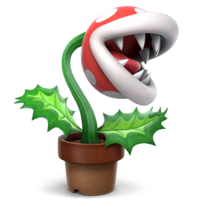 Piranha Plant was confirmed as a DLC character on November 1st, 2018, making its debut as a playable character for the first time in any game. Piranha Plant was released on January 29th, 2019, and was available for free to players that registered the game with My Nintendo by January 31st, 2019. It was later made available as paid DLC separate from the Fighters Pass on February 1st, 2019. On Mushroom Kingdom in Ultimate. Piranha Plants once again appear in 2D sprite form on the returning Mushroom Kingdom stage. Piranha Plant, the dog from Duck Hunt, Palutena, Ridley, Dark Samus, and Wii Fit Trainer are the only playable characters in the Super Smash Bros. series that do not have a playable appearance in any other video game. However, Fire and Poison Piranha Plants are enemy captures in Super Mario Odyssey. Petey Piranha, a Piranha Plant himself who appears in Piranha Plant's Final Smash, has also been playable in various Mario spin-off games. 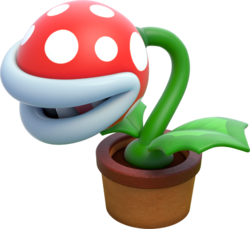 Piranha Plant is the first playable character in the series to be a generic enemy. Piranha Plant is the only character with no eyes at all, as Mr. Game and Watch's model changes to have eyes depending on what attack he uses in Ultimate. Piranha Plant is the first DLC character to receive a Guidance in the game that was DLC. Piranha Plant and Mewtwo are the only downloadable characters in the Super Smash Bros. series that are not human or part human. Piranha Plant is the only playable plant character in the series. Piranha Plant is the only character in the entire series that can attack when footstooled. Piranha Plant, R.O.B., and Mr. Game & Watch are the only playable characters to not have a "proper" face, meaning it consists of a mouth, eyes, nose, etc. This is excluding Samus and Dark Samus, who wear helmets over their faces. In Mr. Game & Watch's case, his eyes do exist, only showing up in certain animations; prior to Ultimate, however, this was not the case. This page was last edited on April 20, 2019, at 19:44.